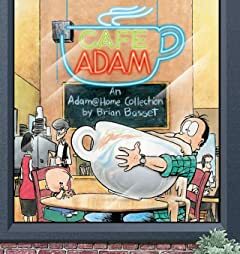 When Brian Basset first created his strip, Adam, it had a Mr. Mom theme running through it. It was unusual at the time for a man to stay home while his wife played the corporate games -- even if he was working -- and Basset used the situation to its fullest comic potential. These days, however, home-based offices are increasingly common, and Basset finds he was merely leading a trend. That's one reason the creator of this charming cartoon changed the name of his strip last year to Adam@home. In this sixth collection, the one-time Mr. Mom focuses on a whole host of compatriots who hang out at the local coffee cafe, log in remotely, and compare work-at-home notes. 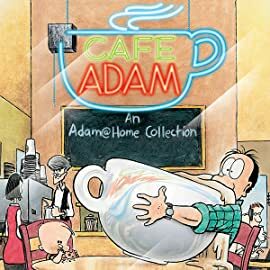 In Cafe Adam, an all-new Adam@home collection, Basset mines the laughs in all sorts of home-office and coffee-house-based dramas, including keeping in good standing with the local barista (no jokes about the nose ring), dealing with client complaints by handing over the phone to a screaming infant son, and helping out his kids' class at school. He also revels in the little things, from changes the nearby Kopyko made for workers like himself to being able to attend an office Christmas party, even if it's virtual.Through it all, Adam's wife, Laura, who still has to show up for her job at a local bookstore, and his kids, Katy, Clayton, and Nick, help the Newman household retain its balance. An engaging family, the Newmans have become an essential source of amusement for Basset's countless fans.